Ironically, not only was Isaac Asimov the author whose writing seduced me into a life-long love affair with science fiction, he would establish the ground rules for my fantasy writing also. In an essay written for Asimov’s Science Fiction Magazine, he explained “Why I do not believe in Magic.” If magic really existed, he argued, it would be a natural force like any other, subject to the same laws and limitations that governed all natural forces. There would be Laws of Magic that could be studied and tested. Magic would be consistent with the First Law of Thermodynamics (energy can neither be destroyed nor created, only changed in form) and the Second (left to its own devices, energy tends to disperse). Because these things are rarely true in fantasy novels, he wrote that he was not able to manage the suspension of disbelief necessary to enjoy them. He was right, of course. And I will add another condition to the list: magic as a natural force should be neither good nor evil, any more than fire, water, or wind is good or evil. Like fire, it should be useful when controlled, dangerous if uncontrolled. The fact that we build windmills does not mean we stop fearing hurricanes. These were my guidelines in designing the fae, a terrifying natural force that could transform human desire into physical reality. The problem was that the fae did not always agree with us on what “desire” was, or what that reality should be. In fact, it turned out to respond best to strong emotions of any kind, and since human beings have evolved a jerry-rigged cognitive system with three brains, multiple levels of consciousness, and numerous badly-repressed emotions, it was a dangerous situation for humans. Against this background I would set a Faustian drama of the highest stakes: two men drawn from opposing poles of the human spectrum, forced into an alliance that would change them both – and their world – forever: Gerald Tarrant, a man whose hunger for knowledge drove him to commit such henious acts that he had become a dark legend in his own time, and Damien Vryce, a warrior-priest whose innate morality seemed unshakeable. Forced to ally against an even greater evil, surrounded by sorcerous manifestations of mankind’s greatest hopes and darkest hungers, these two would test the boundaries Good and Evil as we know them, and explore that uncomfortable realm within ourselves where there is no black or white, only gray. The latter of course has become my trademark. Colonists were chosen for stable, “moderate” temperaments; fanatics of any kind, particularly religious fanatics, were not accepted. The founders believed this was necessary for their “melting pot” concept to work. And it would have, too…had the fae not encouraged the most extreme human passions, driven mankind back into a technological Dark Ages, and rewarded religious faith with a host of accommodating demons that gave them a competitive edge over the more mild-mannered, less creative members of the expedition. 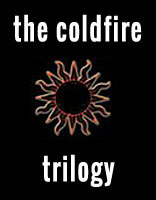 That, then, is the unspoken history behind The Coldfire Trilogy, which I hope will answer some of the questions fans have had about the setting. The colony is not meant to represent the whole of Earth at that time, or make any statement about space colonies other than to say “this is one of them.” It is simply one story among many…but it’s the one I chose to tell. Copyright© 2019 C.S. Friedman. All rights reserved.